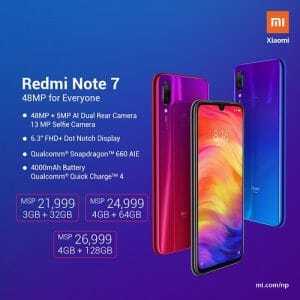 Xiaomi launches Redmi Note 7, the most anticipated phone and Redmi 7, a new affordable phone in Nepal. 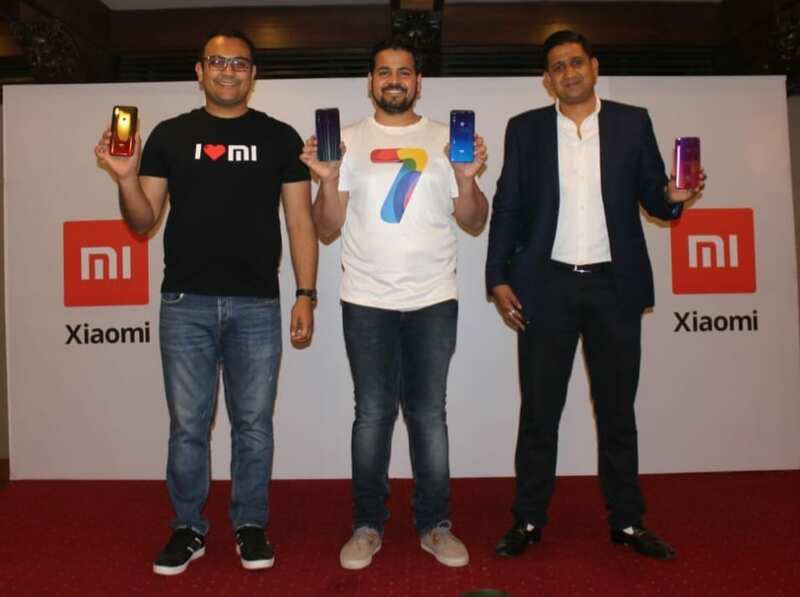 Xiaomi Nepal launched Redmi Note 7 and Redmi 7 at an event in Hotel Annapurna on April 5th, 2019. They have already teased the launch on their official Facebook page with 7 number. People wanted Redmi Note 7 in the Nepal market but they had to rely on the Gray market for the phone. With the launch, now you don’t have to take risk buying from the Gray market. 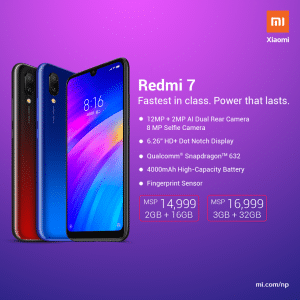 Find the specs, price of Redmi Note 7 and Redmi 7 in Nepal. 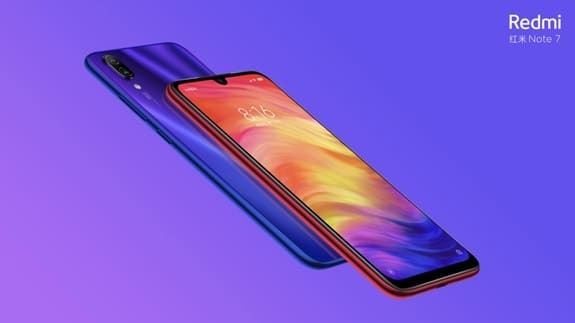 Redmi Note 7 resembles a flagship phone with a 48 MP rear camera which is the main selling point of the phone. It has a 6.3 inches FHD+ screen with 19.5:9 aspect ratio with a waterdrop notch. The phone has Corning Gorilla Glass protection on both sides. The phone is powered by a 2.2 GHz Octa-core Snapdragon 660 processor to provide the peak performance needed for games and multi-tasking. Redmi Note 7’s rear camera has a resolution of 48 MP with Samsung ISOCELL Bright GM1 backside-illuminated CMOS sensor. When taking pictures, the sensor uses Samsung’s Tetra cell technology that merges four pixels to work as one large 1.6µm pixel. This greatly increases light sensitivity and makes the resulting 12MP image much brighter and clearer, even in low-light conditions. They combine the 48 MP camera with the AI features, night mode, scene detection, beautify and portraits for better photography. Redmi Note 7 lasts for a whole day which is possible due to its 4000 mAH battery. It also has a USB type C charger which supports Quick charge 4. The IR blaster enables to use the phone as a remote control for TV and more electronic devices. Although the phone doesn’t come with an IP rating, the buttons and ports are shielded to reduce the impact of accidental splashes. 6.3-inch Full HD+ (2340 × 1080p) Dot Drop Display with Corning Gorilla Glass 5. There are three variants of Redmi Note 7 available in Nepal. Similarly, there are three different colors namely Space Black, Neptune Blue, and Nebula Red. The price of Redmi Note 7 for 3GB+ 32 GB variant is Rs 21,999, Rs 24,999 for 4GB + 64 GB and Rs 26,999 for 4GB +128 GB. Along side Redmi Note 7, Xiaomi also launched Redmi 7 in Nepal, which is the latest addition to the affordable phones in Redmi series. Redmi 7 is powered by Snapdragon 632 chipset featuring Qualcomm Kyro 250 Octa-core CPU. The phone also has a dot drop HD+ LCD display of 6.26-inch size, 19:9 aspect ratio. The screen is also protected by Corning Gorilla Glass 5. The screen also provides a good experience for gaming and video play. 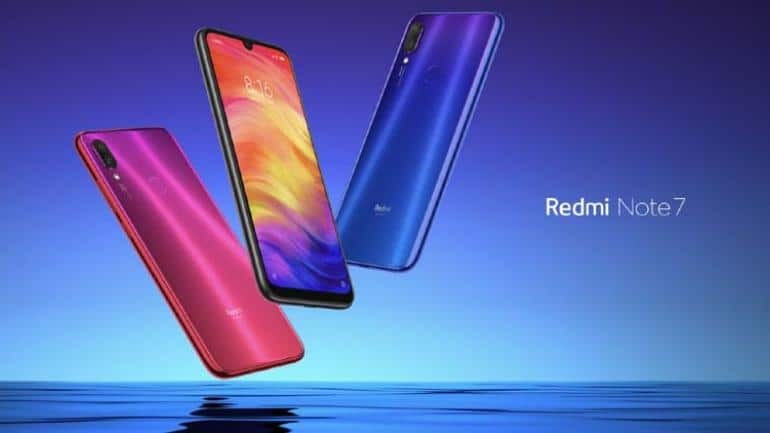 Redmi 7 has a gradient design in three colors: Comet Blue, Lunar Red, and Eclipse Black. The phone has a 4000 mAH battery that has a standby time of 400 hours and lasts for a full day excessive usage. The IR blaster also makes the phone a universal remote control device. The phone either has 2GB RAM and 3 GB RAM version. The price of Redmi 7 phone is Rs 14,999 for 2GB+16GB version while the 3GB+32GB costs Rs 16,999. 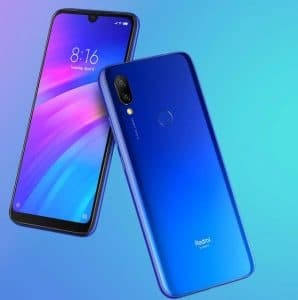 As stated above, Redmi 7 is available in three colors namely Comet Blue, Lunar Red, and Eclipse Black. Redmi Note 7 and Redmi 7 phones are now available countrywide in 900+ offline stores and also on Daraz online store.